FLAGSTAFF, Ariz. - In the mid-1950s, air travel was a shadow of the highly advanced operation of checks and rules seen today. The skies were largely uncontrolled, and pilots outside major U.S. cities relied on sight to avoid catastrophes. Then, two commercial airplanes crashed over the Grand Canyon in June 1956, killing all 128 people aboard in the deadliest aviation disaster of the time and helping spur an overhaul to flight safety. A country already grappling with increasingly busy skies pressured Congress for major changes to improve air traffic control and radar systems and to create a federal agency to regulate it. "It really did underscore for the general public, for the first time, that much of the air space in America was uncontrolled at that time," said Peter Goelz, former managing director for the National Transportation Safety Board. "Once you got up to 20,000 feet and beyond the terminal radars, it was see and be seen." 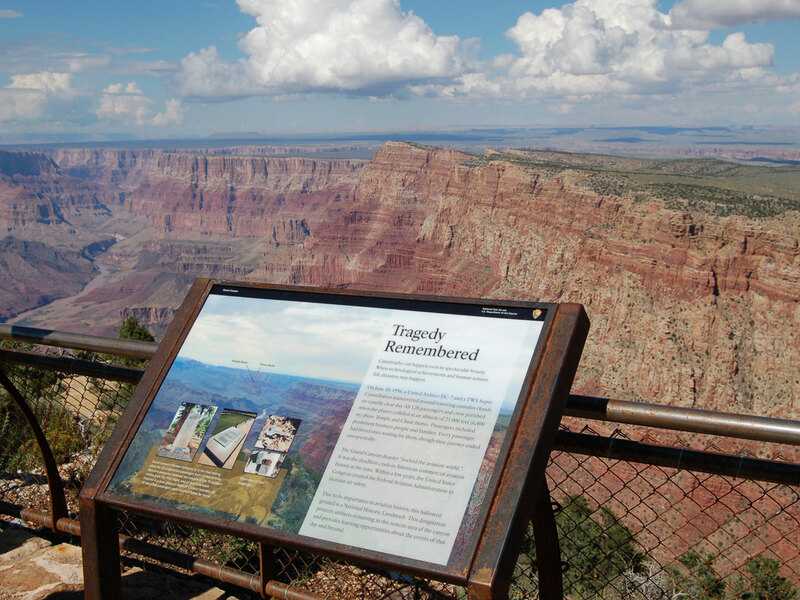 Grand Canyon National Park will mark the designation of the crash site Tuesday as a National Historic Landmark in a ceremony overlooking the gorge on the east end where the wreckage was scattered over 1.5 square miles. Some of the victim's remains never were identified, and most of those that were have been buried together in mass at cemeteries at the Grand Canyon and the northern Arizona city of Flagstaff. The United Airlines Douglas DC-7 and a TWA Lockheed Super Constellation both left California on June 30, 1956, eventually cruising at the same altitude - 21,000 feet - after the TWA pilot requested to fly above the clouds. Shortly before 10 a.m., both pilots reported to different communications stations that they would be crossing over the canyon at the same position at 10:31 a.m. The Salt Lake City controller who had that information was not obligated to tell either of the pilots they could be on a crash course. It was the sole responsibility of the pilots to avoid other aircraft in uncontrolled airspace. At 10:31, a message from the United flight was later determined to be: "Salt Lake, United 718 ... ah ... we're going in." The TWA flight was not heard from again. The investigative agency, the Civil Aeronautics Board, determined simply that the pilots did not see one another. The agency speculated that the pilots were treating passengers to views of the Grand Canyon while flying through scattered cloud buildup. Meanwhile, pressure mounted on Congress to move faster to make air travel safer. In 1957, President Dwight D. Eisenhower signed the Airways Modernization Act, and airliners were required to have flight data recorders. What's now known as the Federal Aviation Administration began operating late that year. The investigators on the Grand Canyon crash pieced together what happened based on the wreckage. No one saw the planes collide. The family of Leon David Cook Jr., a passenger on the United flight destined for Chicago, was huddled around the television that night awaiting word on what happened. The next morning, dozens of reporters were staked out in front of their Detroit home, said Cook's son Ray, then 12. The TWA wreckage was found first. More than a mile away and several days later, the United wreckage was discovered. Ray Cook said the crash destroyed his family. His mother died 14 years later when she drove drunk off an embankment, and his brother committed suicide at 37. Cook, who broke free from heavy drinking after 25 years, couldn't come to terms with the death for several years. "I used to think every night that my father would walk out of the Grand Canyon, sunburned and scraggly, saying, 'They screwed up, I'm fine, here I am,'" he said. The recovery operation was one of the most extensive and dangerous in the history of the National Park Service. Rescuers had to contend with harsh terrain, swirling winds and the remoteness of the crash sites where the wreckage was twisted, broken and melted. United brought in a Swiss mountain rescue group and the Colorado Mountain Club to help. Former Associated Press writer Frank Wetzel wrote of military personnel silently lifting olive-drab body bags into aircraft. "It was my first look at Grand Canyon," the 88-year-old said in an interview. "I hadn't any concept of its grandeur. At the time, the wreckage was spread out because the impact must have been terrible." The crash sites near the confluence of the Colorado and Little Colorado rivers now are closed off to the public and being preserved for their place in history. Grand Canyon National Park archaeologist Ian Hough said the sites can serve as a learning tool for understanding the significance of the disaster and its impact on families, some of whom shared their stories recently with park officials as part of an oral history project. "The Park Service has to manage those sites as the resting place for those 128 souls," he said. "In many different ways, those people are still there." Jennifer Reed, the only child of United passenger Dwight B. Nims, has just started to grieve. She was 4 when the plane crashed, having been told that her father, a military veteran who was on a business trip, would be back soon. She eventually stopped asking her mother when. She said the trauma runs deep but she is comforted knowing she can talk about the crash more openly now and that it helped spur major safety changes. "Their deaths were not in vain," she said.